June was full of trading excitement due to all the political news releases. It started with the UK general election on June 8th where Conversative Party leader, Theresa May, suprising lost to Labor Party leader, Jeremy Corbyn, causing Euro to strengthen against the British Pound. Next, after French President, Emanual Macron, sweeped the two rounds of the Presidental elections in April/May, the two rounds of the French Parliament elections held in June demonstrated the same momentum with the parties supporting Macron won a overwhelming majority of 350 seats in the 577 strong French Parliament. The expected election results helped support the drop in European stocks and Euro moving higher in June. In the US, all eyes were on the expectations of the Federal Reserve of raising rates, which came true as the Fed raised rates by 25 bps on June 14th and Yellen stated that the US economic recovery continues to be on track. Finally, the UK and EU officially began Brexit negotiations on June 19th, so we'll see what happens during the course of this year. UK's financial regulator, FCA, delays rules to FX and CFD leverages. Cyprus financial regulator, CySec, establishes new rules to Forex Brokers use of Affiliates. UK betting firm, BetFred, establishes regulated Forex Broker in Vanuatu, TradeFred. Saxo Bank shuts down Turkish subsidiary. FX Junction membership achieved 18 consective months of new member growth as total membership reached 24,183. 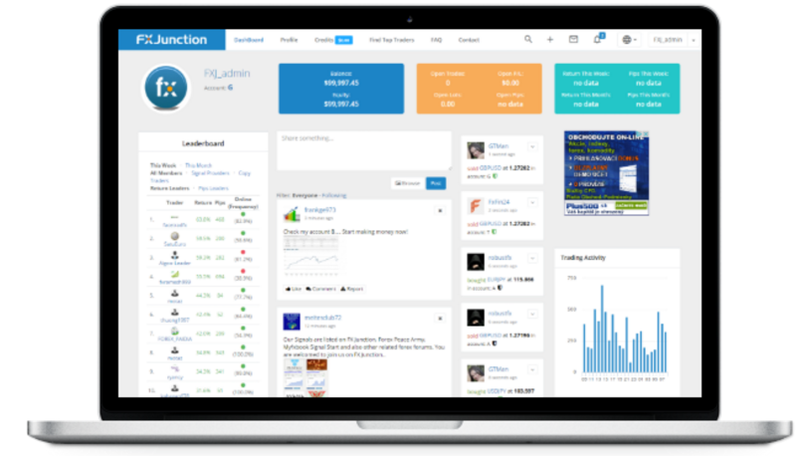 FX Junction members linking their brokerage accounts to their trading profiles have decreased to 9,196 accounts due to our removal of linked accounts from unregulated brokers. Trader Profitability rebounded back above the 50% level to 53.46% after a decline in April and May. Trending Ticker: See what's the most popular currency pairs, precious metals, stock indices, commodities and shares being shared at the moment on FX Junction. Watchlist: Add symbols to your watchlist to filter what real traders are saying about your symbols before you trade. New Languages: FX Junction available in Russian and Arabic. Premium Service: For a monthly fee, members will have access to premium services offered by FX Junction. Rating System: AutoCopiers can rate and share their experience about a Signal Provider. MT5 platform is very interesting news! Wow! Hosted MT4/MT5 account solution, this sounds very interesting.